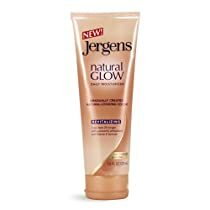 <B>Product Description</B>:Jergens natural glow delivers streak free and hassle free natural looking color. With jergens break through patent pending technology, has no sunless tanner odor flawless, natural looking color just by moisturizing now without odor. Contains erythrulose and DHA provide gradual color development over the course of a week to create a natural looking summer glow.